Update: Get over $100 in additional free ride credit from competing car services here! Uber is a service that allows you to summon a ride via a private car or taxi using just your smartphone. All payment including tip is put on your credit card via the smartphone app, making it a cashless transaction. Your smartphone knows where you are, so you can tell how far away the nearest car is as well as estimate your total fare ahead of time. There are a few different flavors (from cheapest to most expensive): UberX, UberTAXI, UberVAN, UberBLACK (black town car), UberSUV, UberLUX. UberX involves private individuals driving their personal cars, and recently announced price cuts in 36 cities making them 25% cheaper than taxis. Right now new users can get $30 off their first ride by signing up for a new account using this invite link: https://uber.com/invite/uberMYMONEYBLOG. This is triple the usual $10 offer for a limited time, and contains my personal referral code uberMYMONEYBLOG for which I’ll get a free ride as well. Works anywhere in the USA. Good for all ride options. Bonus: Get $25 credit towards any hotel stay booked through the Hotel Tonight app. Sign up online at this link with promo code JPING2 for $25 in credit (new customers only). Then download the Hotel Tonight app (Apple or Android). More info here. I am confused about whether uber drivers accept/expect tips or not. I believe they do. There is a tip setting that is automatically added to the fare when you are done and charged to your linked credit card. Edit: The setting is only for uberTAXI, not uberBLACK and other flavors. 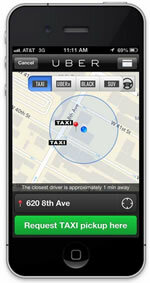 For taxi service, the tip is automatically added. For black car service, tipping is not required, but the drivers will accept tips. I believe they originally tried to insist drivers not take tips, but you know… it’s America and we insist on tipping everybody. I usually will give them a buck or two for helping me with my bags, but rarely for anything else. Thanks for the clarification, dood. With uberBLACK there is no allowable setting for tips, so I don’t think the drivers expect it but more like it is not banned. The website explicitly says “no need to tip” for uberBLACK. I was going to say, you won’t have to tip $5 on a $10 ride with uber, I don’t think the setting even goes that high. Glad you got a chance to use it! No I was just saying about yellow cab: I tend to overtip when the base amount is low, since fear giving a buck or two mat be insulting to the driver. So I’d rather not tip at all. What about safety? How do you know the car you’re getting into won’t take you somewhere and rob you? Besides UberX in certain markets, I believe all the other options use licensed drivers equivalent to hailing a taxi or hiring any other commercial car service. Signed up for Uber and will try it in Chicago (if we ever do get back there). My referral code is SQ7E9 if anyone is willing to use it. Thanks Jonathan! I just signed up using your code. Thanks Jonathan…my code is or7t9 if anyone wants to use it. Next: Statistical Proof of Lifestyle Inflation!